I was in Phoenix for the annual MLA conference (that's the Medical Library Association, not the Modern Language folks), but got there a day early -- early enough to drive out to Scottsdale to go to Knitting in Scottsdale. It's a nice shop, although with perhaps just a little too much novelty yarn for me. Of course, that could just be me, and there was really nice stuff, too. So I bought some! 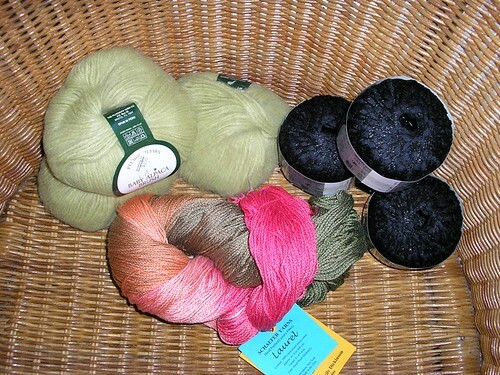 Here we have 3 skeins of apple green Baby Alpaca Brush by Plymouth, 3 balls of Feza Tango in black, and one great big (400 yard) skein of Schaefer Yarns Laurel, in the Emily Dickinson colorway. It's 100% cotton. I have no idea what I'll do with it, but I loved both the name of the colorway and the actual colorway itself, so I had to buy it. Really, I have no idea what I'll do with any of this yarn, although my friend, who I made these for and who I dragged out to Scottsdale with me, fell in love with a triangular garter-stitch shawl they had knit up out of the Tango, so that may be its fate. There was another yarn shop in Scottsdale called Jessica Knits, but it was farther off the beaten path, so we didn't make it there. In addition to buying yarn, I've done a little knitting, too. I worked on both the second sock and the shawl during a couple plenaries. Although I've seen knitters at MLA before, they seemed to be everywhere this meeting - during one plenary, there was one in row behind me and one just in front of me! I also had loads of quiet time to turn the heel last night during my 4 hour lay-over in El Paso. It was only supposed to be an hour, but delays meant that, instead of taking off at 8:25 p.m., we left at about 11:30. I got all the way home around 2:45 this morning. My poor sister, who had planned on picking me up at the airport at 10:45, came for at 1:45 instead!